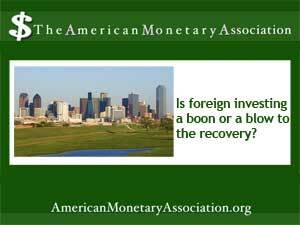 Is foreign money propping up the US economic recovery? International investing in key economic sectors continues to grow every year – and that raises concerns that foreign investment could crush its US competitors and compromise growth in the long term. That’s a paradox that experts are watching in the newly rebounding housing market, where foreign buyers invested nearly $7 billion in residential properties alone in 2013. A new report by CNBC reveals that four of the top five cities for global real state investment in 2013 were in the United States And the trend seems likely to continue, as investors from countries around the world flock to buy residential and commercial properties in a stable, secure environment free of the obstacles facing foreigners in many other countries. Although London topped the list of attractive cities for foreign real estate investment, the rest were in the US. And while all of those listed are major metropolitan areas with high-end real estate markets, foreign investment is taking place in markets all around the country as investors from countries such as China and India seek secure, private places to invest funds. That’s a phenomenon US investors need to watch closely – and a reason to follow Jason Hartman’s’ recommendation to diversify holdings whenever possible.